After the dissolution of Bordesley Abbey in 1538 the town of Redditch began to grow and the Gatehouse chapel at Bordesley was restored for Redditch people. 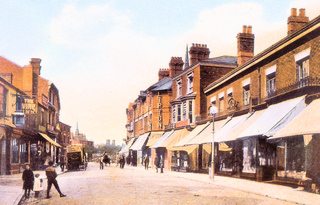 Redditch then meant a number of houses and small cottages grouped round the cross roads at what is now Church Green and the population continued to grow as the needle industry prospered. It was soon found necessary to bring the chapel nearer to them and a chapel was built on the green, on the site now occupied by the Parish Church. Redditch then began to take the shape we now know. Schools and churches were built and the town soon became a parish, and was no longer a part of Tardebigge Parish. This was in 1846, and was followed after a few years by the building of the Parish Church. A few more years and the railway had come to Redditch, while its roads to other towns were improved, and a new road made to Birmingham. It was a century of great activity and the boundaries began to expand . This continued into the 20th Century as more industries came into the town, and the making of needles and fishing tackle was joined by motorbikes, springs, batteries and other light industry.The most recent major change for Redditch was the designation as a new town in 1964 and, since that time, the population has increased from 32,000 to nearly 80,000 and has been transformed in many ways.In terms of links, there are no significant histories of the town on the web. For any in depth history it is necessary to look at some of the books which have been published. However, there are some sites with useful information. http://en.wikipedia.org/wiki/Redditch The on-line encyclopaedia - Wikipedia - has an entry for Redditch with some history. http://webbsredditch.co.uk This has the history of the local Webb family with a substantial Redditch history.